I am on my way to Puerto Plata, Dominican Republic, land of travel fantasies, windsuring and kite boarding vacations for hundreds of thousands of Americans each year. It's 38ºF and raining but on the JetBlue jetway in front of me a guy is joking, "70 and cloudy, why are we going to DR anyway?" Behind me four homies are putting away their Beats headsets to wrangle carry-ons. A little girl asks her mom in French, "How big is the pool?" and some frat boys yell to each other, "Can't wait to try kite surfing." From the window, I see the tourist suburbs outside the port of Puerto Plata. There is the purpose-built Playa Dorado; Cabarete, the wind sports capital of the Caribbean; and gentle Sosua with its Caribbean Colonial and Victorian style wood-frame B&Bs. 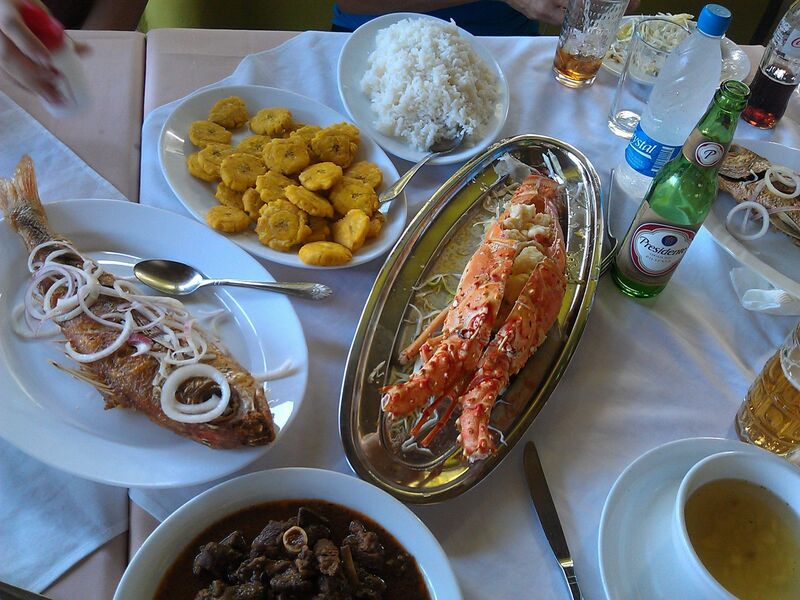 The north coast attracts travelers looking for a more authentic Dominican scene. Roadside shacks, the local car wash where everyone hangs out, the tin-roof boutiques with designer sneakers displayed in rows outside on the curb — these are the stuff of the real DR. The island's Atlantic coast, the first to be developed back in the late 70s, had lost some of its luster in comparison with newer mega resorts around Punta Cana. But it's coming back as an eco-adventure and extreme sports destination. There are plenty of tourists but it still feels real, as you can see from this video tour of accommodations, meals and activities that families can find in and around Puerto Plata. It is said that mountains and trade winds have spared the DR from the brunt of hurricanes that pass through the Caribbean, but those trade winds are responsible for the region's biggest tourism attraction — wind sports. About an hour from the Puerto Plata airport, the once sleepy windsurfing mecca of Cabarete has evolved to accommodate backpacking surfers, kite boarders and now the affluent young, eager to adopt an extreme sport. Having toured several tourist enclaves outside Puerto Plata, Cabarete is my pick for an active family vacation with older children. Teens especially will appreciate the chance to hang with champion athletes and freely roam the pot-holed main street. In many ways, Cabarete resembles the Rivera Maya's Playa del Carmen 20 years ago, before Quinta Avenida was well paved and Ralph Lauren had pushed aside the local bodegas. In short, scruffy but charming. The long scalloped beach at Cabarete has been unofficially divided into Kite Beach for kitesurfers, a windsuring beach, and El Encuentro for surfers. What makes the beach distinctive, in addition to the winds that build almost daily after 11am, are the many thatch roof bars and cafes that operate on the sand. As you walk along, stepping between the stray dogs and the kites and lines stretched out to dry, you can have a beer, a massage, a hair braid or a yoga lesson. 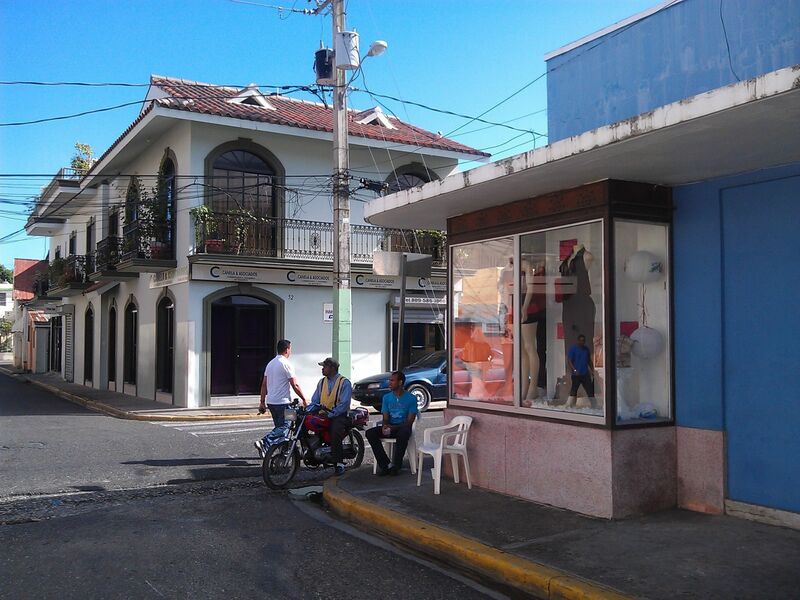 The town's single commercial strip, the highway between Puerto Plata and the Samana peninsula, is dotted with bars, T-shirt stores and local tour operators selling ATV rentals, banana boat rides and trips to nearby Monkey Jungle. Our press group traveled to meet Laurel Eastman, founder of LEK, the Laurel Eastman Kiteboarding school. Ms. Eastman and her partner Peter Richardson show us around The Millennium, a new condo hotel mid-beach where her school is based. She hopes the glass and marble, loft-like units will attract higher-end clientele who are drawn to the extreme sport of kiting but require more luxury and services than Cabarete has tradtionally provided. We are enrolled in a one-hour LEK kiting lesson, unaware that most beginners require 8 to 10 hours of instruction — much of it on land — before heading out to the surf with their kites. Laurel, an ex-Californian, has a multi-lingual team that is young, incredibly fit and bubbling with positive energy. Merijn Veenis, a ski patrol veteran from Amsterdam, has relocated his family to Cabarete so he can pursue his sport. Young Yonatan Espinal is a Dominican who fell in love with kiting after trying it on this beach; other instructors range from former students to visiting windsurfers but all have a 'we are here to have fun' attitude, necessary on days when there is no wind. Merijn describes the expensive gear and shows us all the safety latches and release system. It is quickly apparent that kiting is for the serious athlete. It requires strength and balance to use the board, and a subtle steering of the bar you hold to control the kite's angle to the wind. Life jackets are required for all lessons but when you're on your own, you need to be a strong enough swimmer to disentangle yourself from the kite after a fall. LEK has taught visitors ranging in age from 7 to 70, with height and weight-appropriate lines and boards. Kite boarding with the LEK (809/571-0564) costs $560 for 10 private lessons; lessons for two family members together cost about 10% less. Has your family already mastered the sport? Kiters who vacation in Cabarete and rent gear must be certified by an industry trade group to establish their background and abilities. As an extra precaution, LEK reviews renters' skills and insists that all kiters work with a spotter on the beach. Unfortunately, today the wind is not strong enough to go anywhere near the water. Some guests who come for a week to master a sport learn this the hard way. Our teachers confirm that November and May are the least windy months — July and August blow the most — so, after suiting up in our harness and helmet, we remain on the beach for the basic safety lesson. We are exhausted after an hour in the hot sun. That's when the fun attitude comes in handy. The bottles of Presidente appear at the beachfront bars, most of which open right onto the sand as well as the main street. In flipflops we check out Ono's and some of the other shacks where reggae music and/or rap is playing; cheap Cabarete draws a very diverse international community of residents and visitors. It's easy to stay active in Cabarete, windy or not. Families can try SUP, or standup paddleboarding, a popular sport that rules at Playa Encuentro. There are many rental places like Vela Tours giving lessons in SUP, boogie boarding and even horseback riding on the beach. Iguana Mama can take you canyoning in the local rocks and waterfalls, mountain biking in the national park (and yes, Iguana Mama has a 3,000-foot-long, family-designed downhill adventure), or hiking in the pristine environment. At Monkey Jungle there is a zip line whose proceeds support medical clinics for the local communities. Kids above age 6 or so with parents can sightsee along the north coast on a kid-friendly kayaking outing with Kayak River Adventures or enjoy an ATV ride into the nearby woods. If you've got kids with patience, the local operator Dominican Fisherman runs special trips designed with short attention spans in mind, and kids under 10 go free. You can spend a day in La Boca learning about the local fishers' lives and catch crab, or take a boat ride with them to spot dolphins, birds and other wildlife. The Cabarete Coffee Company, with its free WiFi, A/C and dark roast, sounds like the local Starbucks, but they also have day trips to meet local farmers at a cacao plantation and see how chocolate beans are harvested. At Otra Cosa, a popular seafood place owned by a French couple, kids can play in the tidepools along the shoreline while parents dine — and dine well we've heard. Sunset is the best time to visit pretty Sosua, a half moon shaped harbor next to Cabarete that is undergoing transformation. Once a quiet town until the day that the dictator Trujullo allowed a boatload of Jewish refugees to take shelter there, Sosua is now blossoming as a tranquil tourist resort that attracts scuba divers. There are still some Jews involved in the local dairy industry, a synagogue, and a Holocaust heritage museum. 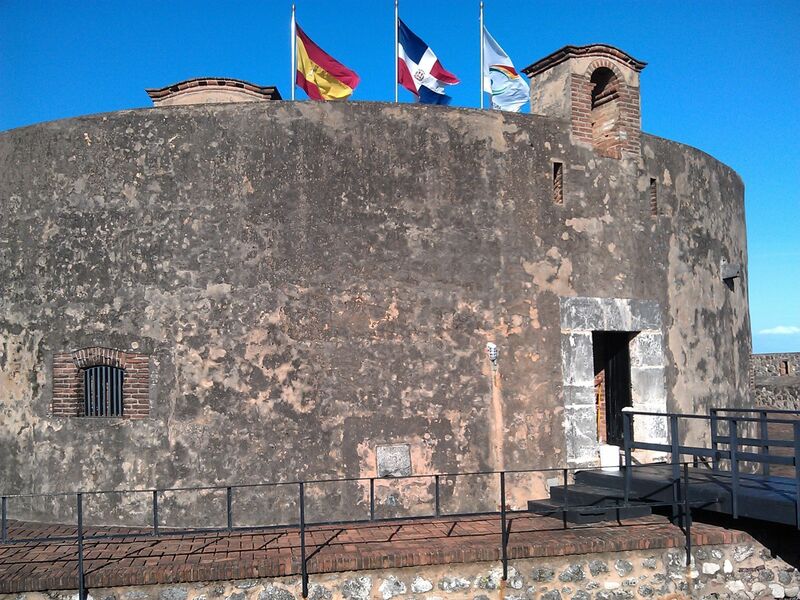 We learn that the town was burned by the Spanish when they retreated during the Dominican independence movement. The wealthy Dominicans rebuilt Sosua in the prevalent style: Victorian country houses with gingerbread scrolls and ornate porches. 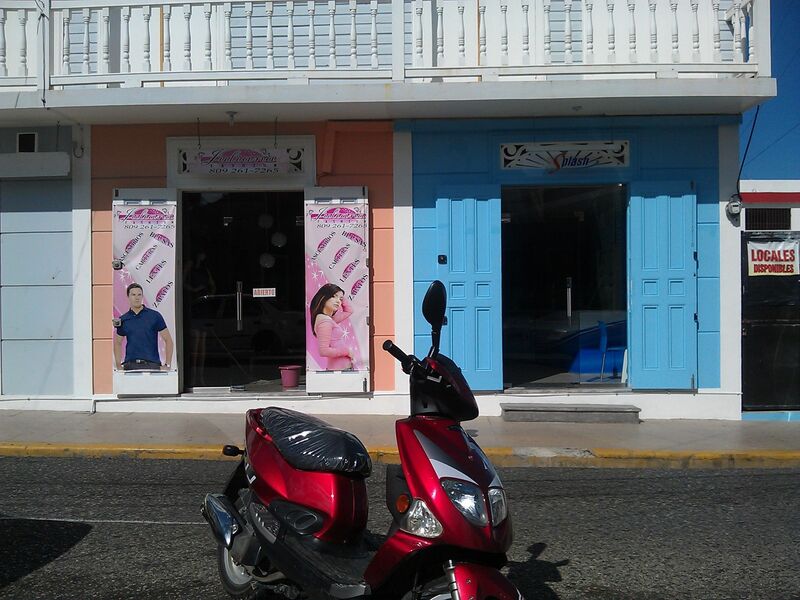 Sosua, like Cabarete, has a very active party scene with many bars (the drinking age is 18) and Dominican cuisine restaurants tucked into its winding lanes. The pretty, sky blue Victorian Hotel on the cliffs above the bay has recently taken over the former Sosua Bay Resort, a stylish contemporary hilltop hotel. Together they offer a Casa Grande (the Victorian-era lobby), with your family's choice of traditional Caribbean plantation rooms or standard resort fare boasting A/C, balconies, mini-fridges, coffeemakers and microwaves. On property there are rental bikes, gym classes, scuba lessons in the pool, billiards and evening entertainment. The facilities include two swimming pools, a few restaurants and bars, a supervised Kids Club, kiddie pool, babysitters with advance reservations, and a spectacular sun deck that hangs high over Sosua Bay. For more information call the Victorian House at El Batey, Sosua, Puerto Plata, Dominican Republic (809/571-4000). In addition to the popular Viva Wyndham Cabarete family all-inclusive resort very close to LEK, there are many small hotels and a few expensive boutique hideaways off the beach. The Millennium Resort in Cabarete that houses the LEK School is very stylish, with two-bedroom condos available for about $350 per night in the busy winter high season. The one-bedroom suites with a soafbed start at $150 per night double occupancy with a two-night mininumum. Additional adults pay $50 per night and children under 12 pay $25 per night. A family of four can book a two-bedroom condo when available, for the rate of $3,000 per month. SeaHorse Ranch gets a very upscale crowd who want to bring their horses and ride in this mountainous region; the Ocean Club is another option on the luxury side of life. There are still dozens of original pensiones along the north coast that rent for $30 a night; they're mainly located in the few blocks inland from the beach and can be found online. A popular budget accommodation with TV, free WiFi and dormitory style housing is the Laguna Park Hostel (829/804-6640) located on the lagoon of Cabaretes National Park. Check the Dominican Republic tourism website for more information. There's always shopping. Many shops sell Haitian style folk paintings, wood carvings, painted masks and silly souvenirs. 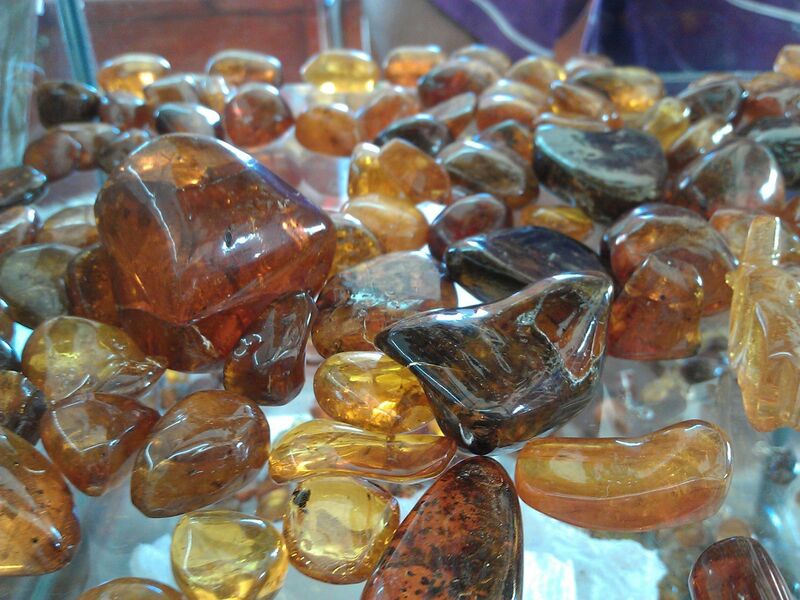 The most interesting take-homes we saw: simple, locally tooled silver jewelry with amber or larimer (like a pale turquoise) stones. At our visit, the Dominican peso (written RD) was worth about 3 cents but most transactions are done in US dollars. Don't forget to bargain. By the way, in addition to her school, Ms. Eastman gives back a lot to her community and may be able to help you do the same. She runs Kiters for Communities which sells shoulder bags sewn by Haitians out of damaged kites; KB4Girls to encourage women in the sport; and supports the Mariposa Foundation to provide educational opportunities to the children of Cabarete. Get in touch if your family is in town long enough to consider volunteer opportunities or stay awhile longer and help out.